I belong to a quilt bee called the “Queen Bees”. 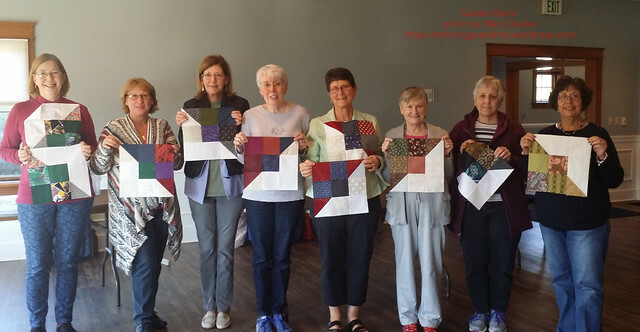 It is a group of Ocean Waves Quilt Guild (Lewes Delaware) members who get together once a month and work on projects. Sometimes we work on a group project, and other times we work on our own projects. We met this month in a new location and were happy with the lighting, tables etc. We will need to remember to bring our extension cords if we are bring machines. Imagine the “buzz” as 8 to 12 women gather with projects and machines. Good thing there is a door we can close! One of my favorite parts of our bee is the show & tell time. I often forget to grab my phone to snap a few pictures. This month at our bee I remembered in time to catch these two pictures. The first is a wonderful applique project done by Sharon J. She told us the name of the pattern is Jungle Walk for a Cause, by Harebrained Happenings. This quilt will go to a new niece or nephew. It is stunning up close and in person. I just love the SHOES each animal is wearing. The other stunning quilt that I took a picture of was by Joyce D.
I love all the redwork hand embroidery. Beautiful job Joyce! 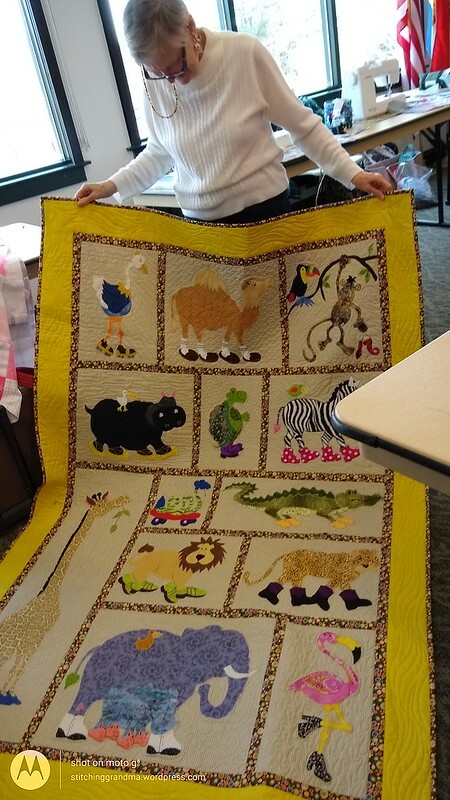 Lastly – I want to share with you the quilt that was made by the members of the Queen Bees. We made blocks at our October bee for the Carolina Hurricane Quilt project. The block finishes at 12″ and is called the Perkiomen Valley block. This same block was used last year for the California wildfire quilts and is a great “fast sewing” block. I assembled the blocks and our member Sharon J. offered to long arm quilt the top. Marta B. is working on the label for the back, using her embroidery machine. I will be binding it using my favorite method, “Susie’s Magic Binding”. We had a lot of other show & tell items, as this is a very busy group! I just failed to get more pictures! 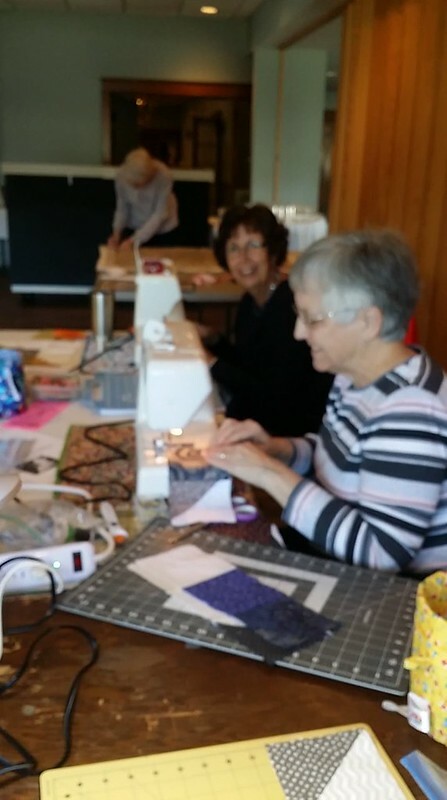 Do you belong to a small group that quilts or sews together? What do you like best about being in a small group? From my standpoint, I enjoy the helpful sharing that takes place with this group. There were 8 of us at the bee this week, sometimes we really fill a room with all 12. 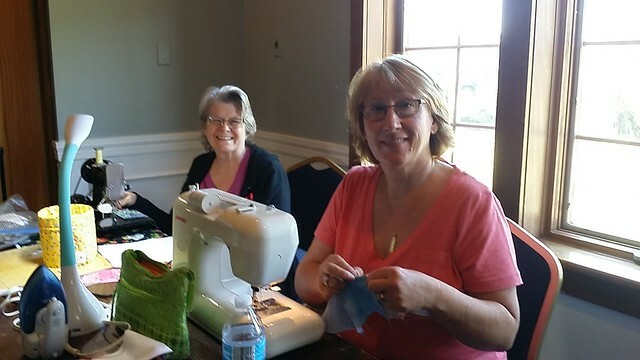 We are starting our 4th year together and it is so fun to see the friendships grow along with the skills of the former “newbie quilters”. They are NOT newbies anymore! After I came home from church on Sunday, I spent about 3 hours in my sewing room. I cleared off “most” of the stuff that was on my design wall, and started playing with the Carolina Hurricane blocks. Some of these blocks were made on Tuesday by my friends in the Queen Bees. One of our members sent her blocks in by mail, since she could not attend the bee, and others have promised additional blocks. Queen Bees is associated with Ocean Waves Quilt Guild in Lewes DE. The blocks are all 12.5″x12.5″. I set them on a 6 x 8 grid, and played around until I had a pleasing arrangement. I currently have 41 of the 48 needed blocks. I have 7 more sets ready to sew. Those promised blocks are coming in this week and will add additional variety to this scrappy project. This layout will produce a 72×96 quilt. Getting “close” to that queen size. Carole – From My Carolina Home commented on my post on Sunday, she indicated 42 (6×7 grid) blocks would make a full size, and 56 (7×8 grid) would be enough for a queen. Making a 7×8 grid, I think a new “pattern” for the layout will be needed. I will leave it “as is” for now and work on the rest of the blocks that I have “ready to sew” this week. On Friday, 3 Queen Bee members will be at my house and maybe they can help “re-arrange” to make that 7×8 grid. Maybe we will have enough blocks in by then to go for the BIGGER quilt. 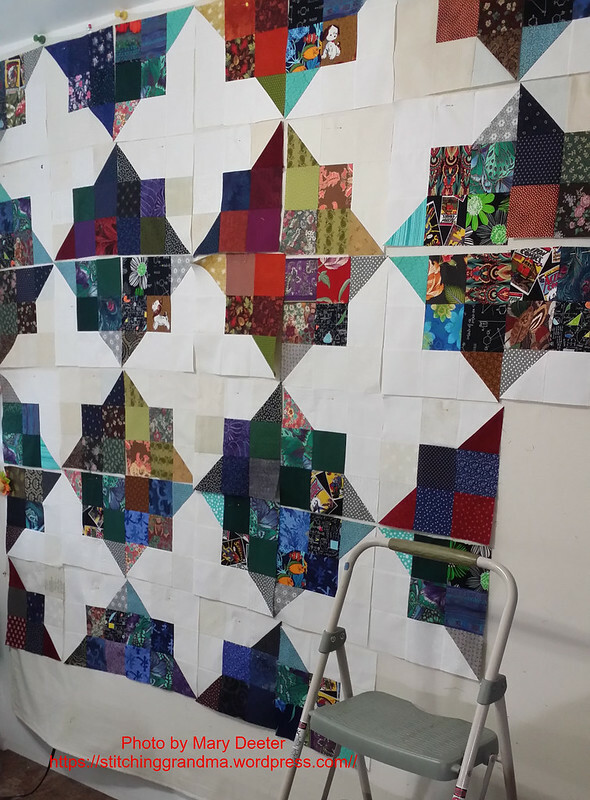 I looked back at the previous quilts that Carole had assembled last fall in response to the California Fires to see those various layouts. It turns out, she didn’t use this one at all. So, I kind of like that it is different and unique. Are you working on blocks in support of the Carolina Hurricane quilt project? I know some of my readers are, and have them ready to mail in November when Carole posts the address. Fingers crossed, maybe this quilt top will be sewn together! 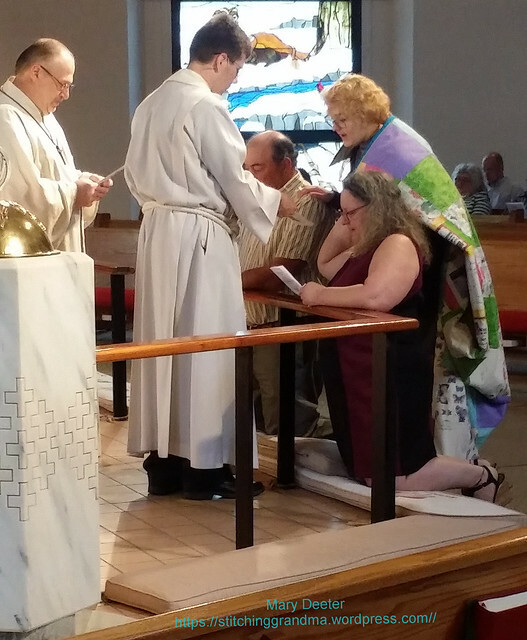 Go check out Carole’s blog, link above, and enjoy the other things she has going on during her “Autumn Jubilee”. Be sure to “tune in” on Monday on Pat Sloan’s afternoon http://www.allpeoplequilt.com/magazines-more/quilting-podcast at 4 pm (ET) and listen for Carole’s interview! SO cool that Carole has gained recognition from such a famous quilter! Let me know if you tuned in! I made a few blocks right after that post, and gathered up supplies and made up “kits” to make more blocks. I have a few scraps and squares and leftover half-square triangles, so it was quick to assemble those kits. I usually don’t “save’ 4.5″ blocks, but I had LOTS of 5” squares in my Scrap storage system. More about that in a minute…..
My wonderful bee – the Queen Bee’s took on the challenge of making blocks during our bee gathering last Tuesday. They came armed with scraps and sewed for about 3 hours. During the bee gathering I snapped some photos and sent them off to Carole! It was fun to get a group photo. Here are a couple of pictures of the members, hard at work. I came home from the bee with a stack of blocks, and still a handful of the kits I made for myself. I didn’t seem to get as much sewing done there as I had planned, so I spent the week working on more blocks. My method for working on these has been to make “2 at a time”. I use those great little foam core design boards to lay out 2 blocks and move them to the iron and back to the machine, and I can “keep the angles” right fairly easily. Look back at my blog here – Foam Core Design Boards to get info on the boards and how to construct them. 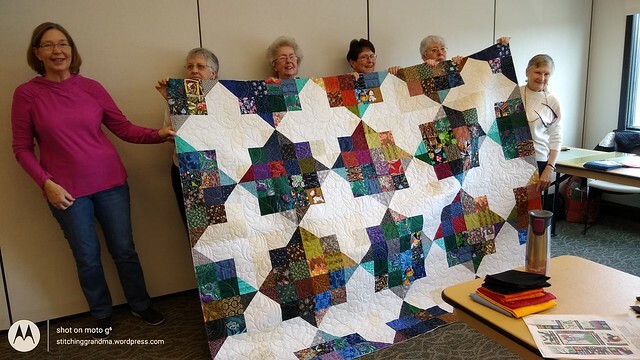 During this bee, it was fun to chat with my “bee mates”, and to learn which ones are following along with Carole on her “Autumn Jubilee 2018”, and who have enjoyed making her mystery quilts. I love that they found her through my blog posts. I also love that Carole linked to my blog post last week. The day she did that, I had 82 new visitors. So, if you are a new reader, and came to find my blog because of Carole, I thank you for reading and coming back for another visit. Be sure to “follow” in your favorite method. I love reading everyone’s comments too. My sister-in-law, Carolyn, wrote about her method on her blog here One Block Wonder Woman and Scrap Overload . 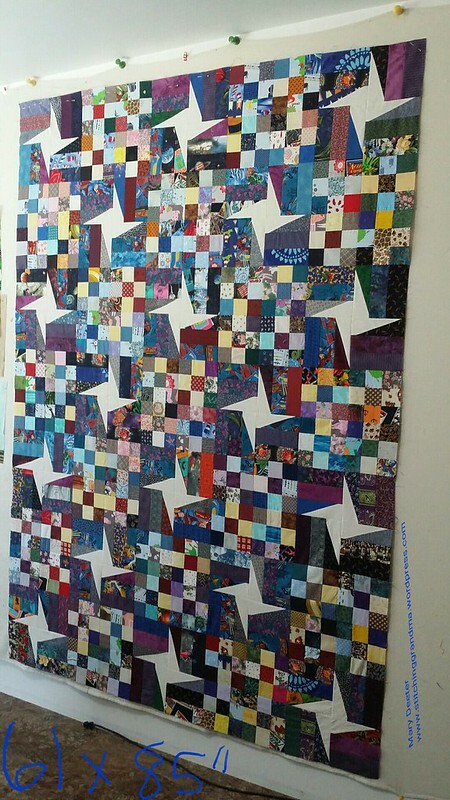 If you are a “scrappy quilter” how do you “contain” the chaos of scraps? For my regular readers, you know that I often talk about projects I am working on that were developed by Carole Carter. She runs lots of mystery projects and has great patterns on her blog. 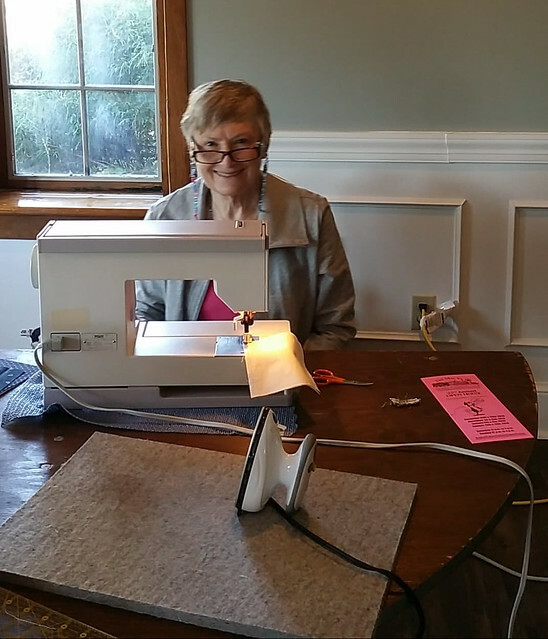 Carole lives in the mountains in North Carolina and is spearheading a quilt drive among her readers to benefit victims of Hurricane Florence. She writes about it today on her blog– From My Carolina Home. Be sure to download the PDF file with the pattern instructions after you read her post. Maybe you can make a few blocks and send them to Carole. Her address is in the comments. I can’t believe August has left us and summer has wound down so quickly! August has been a hot humid month, and September is much the same. Our local kids went back to school on Tuesday, the day after Labor Day in the US. Some areas of the country school has been in session for several weeks. We live in an area that is a summer tourist destination. A few years ago, citizens complained to the state government about schools starting in the middle of the August and not long after the legislators set a “state-wide” start date for schools. So, as the children started back for their “First day” in Delaware, my youngest daughter, my youngest granddaughter and I ventured over to the formerly busy beach area for a bike ride! What a change a week makes in the volume of people on the trail, walking and running. All summer it has been filled with families and young children and yesterday, it was the older crowd. A few moms with strollers around the library and right in town, but once out on the longer trail, my granddaughter in her trailer, was the only child around! 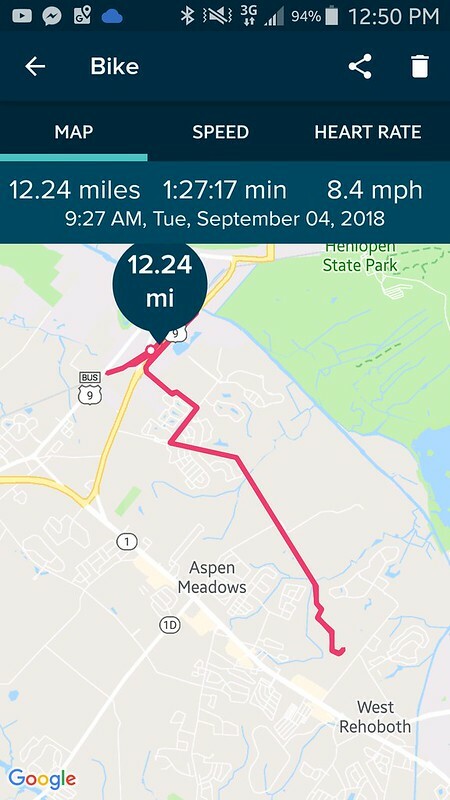 We rode a surprising 12.24 miles ! I was stunned to realize how far we had gone. Up to this point, my longest ride has been about 8.5 miles. I started riding with my daughter in early July, sometimes 2-3 times in one week. I need exercise and this is certainly a fun way to get it. Haven’t lost one pound, but I have found my calves! Now, I am finding myself scheduling bike rides on my calendar into October. I want to make sure I schedule the time so other things don’t get in the way of an opportunity to ride together. I haven’t done much in the way of exercise since I retired six years ago, unless you count climbing the stairs to my sewing room multiple times a day as exercise! So, this is GOOD. As I approach my mid 60’s, those looming health issues we all face demand I do something, and I love to ride. My bike is a TREX, era 1990’s, with good tires, though heavy and a bit squeaky and with it’s quirks. My oldest daughter rode this bike in middle school and high school during that decade, and I rode it off & on in the years following. I put a “new bike” on my Christmas / Spring birthday wish list for myself, determined not to buy one until I have at least 6 months of riding regularly. I really love the local bike shop, LifeCycle in Milford DE. My daughter introduced me to the owners, Ben and Jenn, during a community ride they organize. I’ve done several with a big group, 40 or more riders, and some with smaller groups that my daughter has organized and I am having fun! All in all, a positive direction to move in. Yes, I am still sewing, and I managed to get a few projects done last week. Those batik placemats are coming along. I found a nice 3 yard piece of batik in my “blues” bin and think I can get just about all of my placemats backed with it. I layered and pin basted them and started quilting them over the last week. I have 9 quilted, trimmed and ready to bind. If you click the photo, it will take you to my FLICKR album. Give the picture a second to focus, then you can zoom in and see the free motion quilting (FMQ) on the placemats. It has been good practice. The quilting has been done on my domestic sewing machine using Superior Fantastico # 5021, a variegated blue turquoise and purple 40 weight on top and in the bobbin. Thankfully you can’t really “see” the quilting on those busy batiks on the front of the placemats, but boy can you see it on the back. I will show a photo of the backs ‘next time’. Let’s just leave it as “good practice” for my FMQ and I am getting better bit by bit. Next up for projects is a quick one I did on Labor Day afternoon. I made two bibs to include in a “baby basket” that will be raffled off at our spring quilt show. Since I made so many for my youngest granddaughter, I feel comfortable making these for that event. I tried to pick fabrics that looked modern and might appeal to a young parent. I love this bandana style. I did minimal quilting in a graphic manner, just enough to hold the batting firmly in place that is between the layers. 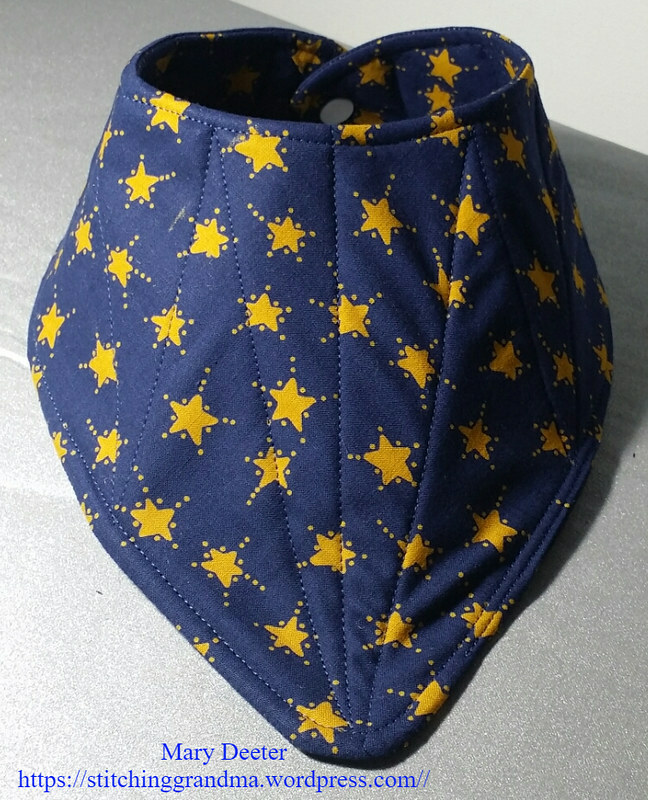 I made a second bib in a more traditional shape with 2 contrasting fabrics. 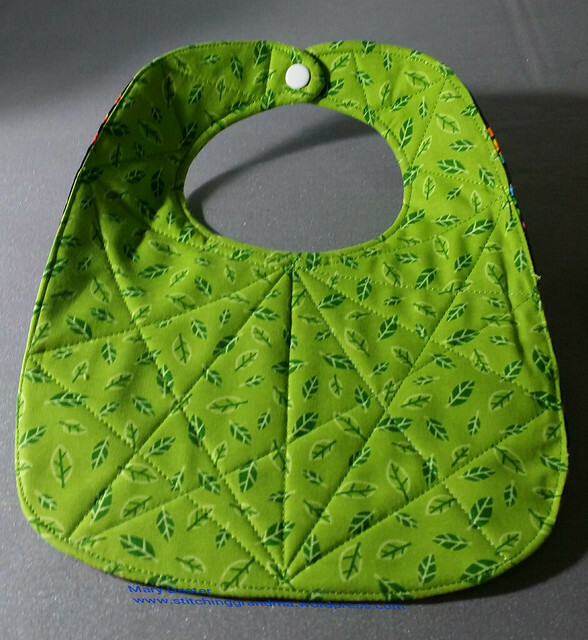 I just love this bright green leaf print. I think it makes a nice reversible to this dot fabric in bright colors. 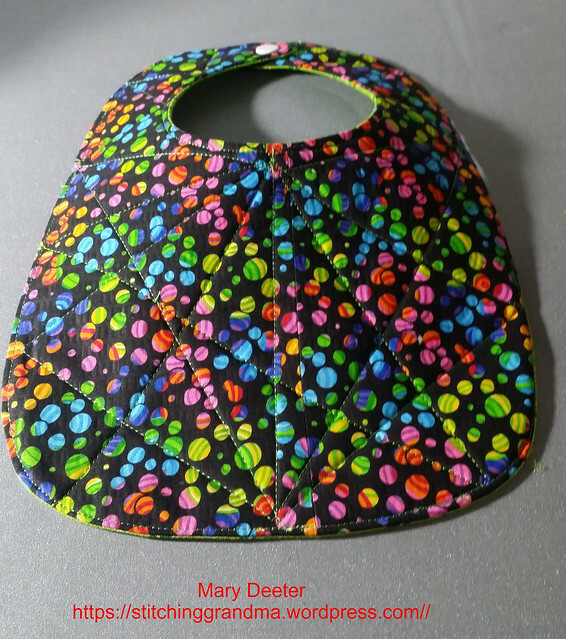 I did a bit more quilting on this bib in a wide graphic shape. They are bagged up and ready for delivery! While I had my “bib making supply box” out, I sorted out all the fabrics I had stored in it, and returned most to my stash, leaving just the basics in the box, like patterns and PUL laminated fabric for waterproofing. 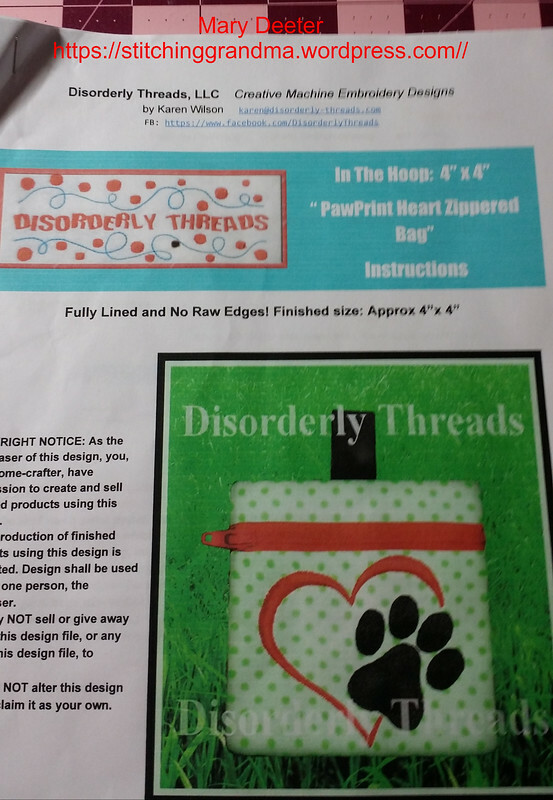 I found a great pattern and instructions for a free “in the hoop” zip bag last week through a group on Facebook. I was happy to find one that would work with the 4×4 hoop on my Brother PE500. The instructions are so well written, and it was worth the 12-14 pages I had to print out, to follow along. I downloaded the design and got busy! This little pouch finished at 3.5″ square. I did use some 505 spray, for temporary adhesive while construction was underway, along with my narrow masking tape. The instructions have you pinning fabric edges, but I found that I liked the masking tape. I am now on the hunt for short zippers that I can use on some future projects! I have a bunch of 18″ ones I purchased at a quilt shop a couple of years ago, but they are really too big for this project and would be wasteful. I’ve dug in my sewing box and come up with a few short ones. I have a similar in the hoop pattern from another designer that puts the loop on the left side of the zipper, and I am going to try it next. 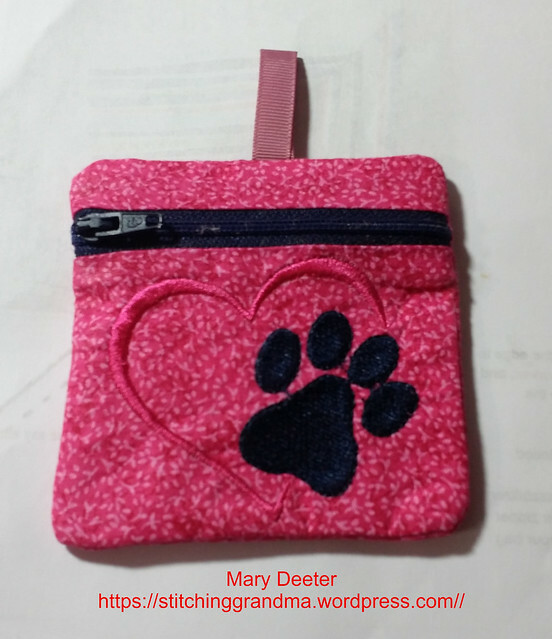 Bother patterns use the same size pieces for the pouch. I have 3 pouches “cut out” and kitted up for my next embroidery club gathering. I do like these quick projects that I can finish in a day or two. I keep working on my placemats, in between, some of these other fun projects. It’s nice to have some “finishes” once in a while. I had to laugh with my husband about all of my quilt tops that are on hangers, patiently waiting for me to finish them. I have to go in search for a heavy duty hanger for one, which was too weighty for the hanger and broke it this week. It is a queen size that is in a state of “limbo”, just hanging around waiting for my next move. I believe it is my Scrap Dance Tango in king size. (Pattern is from Carole – From My Carolina Home. (Follow the above link for pattern information). The one with 1400 or so half square triangles. It is a beauty, and one that I must get busy and quilt. I seem to remember I wanted to add a 2.5″ border all around. Must be time to spread it out on the bed and see if the size is as I wanted it to be and move forward from it’s status. Our quilt show registration is opening next week, and I think I want to show this one, so I must get busy. I need to make a “finish it list” to move it along! Carole – From My Carolina Home always has fun projects and great posts. I also follow some rather “famous in the quilt world” people. Bonnie Hunter has been a favorite for a long time, and I have done a couple of her mystery quilts and taken 2 of her classes. . Those that have followed my blog know that I love her scrappy style and I have written about her scrap storage system, string piecing and linked to her blog many times. This week she is mourning the loss of her brother and I know that the tens of thousands that are her fans feel her grief and offer their sympathy. She has a worldwide following and I hope she can find strength from the “quilty hugs” many of us are sending her way. I pray for peace in her heart and comfort for her entire family. Many quilters find peace during their sewing time, and comfort in the quiet time they spend in their sewing rooms. I’ve read about quilters who work through their grief while stitching in the wee hours of the night. I enjoy the solitude sometimes in my sewing room, and yet, I find great joy in the times I can sew with my friends at a bee. I hope you have a wonderful day working on your special projects. 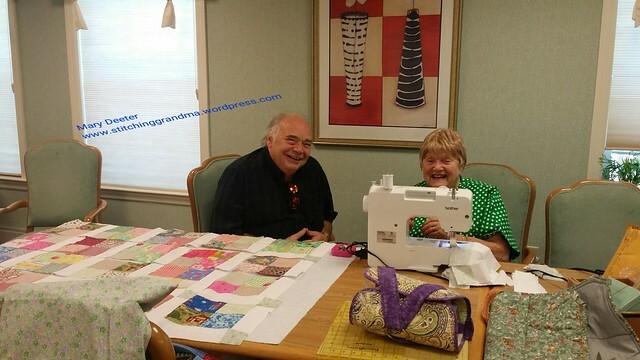 On Thursdays, I often go sew with the residents at Brandywine Assisted Living. I started this project after my friend June moved into the facility. June has been out of commission for over 2 months due to a fall, breaking her back, being in hospital and rehab and unable to get around very much. I saw her last in early June, and found out recently she had gone back to the hospital. Turns out what was really giving her pain were two broken ribs, besides the injury to her back. Well, I like to report I saw her this week, up and walking, with a smile on her face! She wasn’t up to sewing yet, but she is in much better state. I was so glad to see her! Apparently she had been “out for a walk”, with an aide, while we were sewing. We all got to visit for a few minutes, and even her hubby is in better spirits since she is doing so much better. My hubby was very pleased to see both June and her hubby. So, thanks to my readers who have kept dear June in thought and prayer! I have 2 “regulars” , besides June, who like to work on projects, Trish and Dee. Trish is the “seamstress” at Brandywine. Everybody brings Trish things to hem, fix etc. She often gets asked to make things for people and is generous with her time. She “travels” to the room where we sew with her machine in the box, on the seat of her rolling walker. She is a very independent woman, who still drives, and goes to classes at the local quilt shop about 10 miles away. Trish brought a lovely bag she had just made for “show & tell”. Trish is not a quilter, but since I am, that is the direction I am taking the sewing group. The other “regular” is Dee. She IS a quilter, and enjoys working with the fabric and is a power sewer. No instruction needed about 1/4 ” seam allowances or “right sides together” or “chain piecing”. I was given a bankers box of 4.5″ squares several months ago, and thought they would be a perfect start for these ladies. I never know how many people are coming, and this gave me a huge variety of fabric to have ready to sew. Dee and Trish started their quilts in May, laying out blocks they liked, etc. 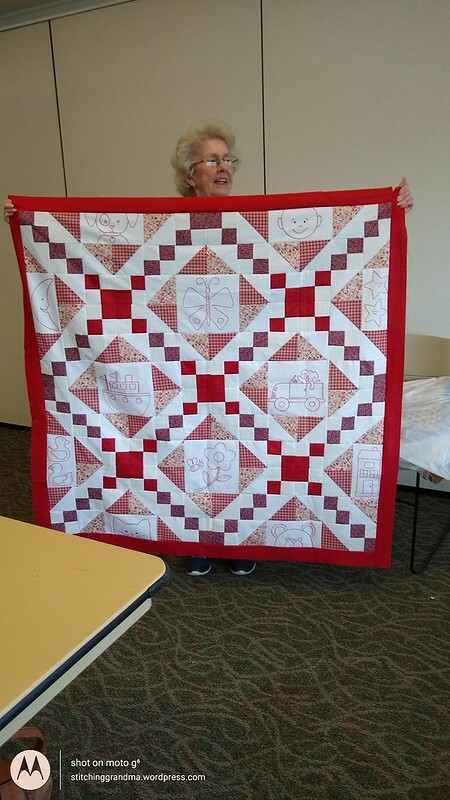 Dee wanted to make a lap quilt, and Trish a baby quilt. This box of squares had a wide variety, and made a good jumping off point. They enjoyed going through stacks of squares looking for fabrics that met their personal requirements! Last month I suggested to Trish that she order 2 yards of white fabric for use as sashing. Trish called me early in the week and let me know her fabric had arrived. When I arrived this week, she had her fabric ready to cut. My quilter’s assistant (aka husband) helped Trish, handing her blocks and replacing them on the design “wall”. (Our design wall is a plastic table cloth with flannel back!) I cut sashing strips and posts, while Trish sewed. With that extra pair of hands, we cut just the right amount of strips, and Trish was able to get them sewn on one side of the block, and all the posts sewn on the remaining strips. She was so happy with how the scrappy blocks were setting with the sashing! Trish was also very appreciative of my “Quilter’s helper”, keeping her pieces straight on the the design space! I have several yards of a very pretty fabric (from June’s fabric stash) that will get used for the backing. Quilters assistant Bill with Trish! They both were having a good time. I think they will be disappointed if Bill doesn’t come “next time”! Next time I go to sew, I will get a picture of Dee hard at work. This week wasn’t a good time for a photo of her. She had taken a bad fall and her face is still severely bruised. She had an interesting story to share to accompany the bruises, and let’s just say, be careful when you are in a hurry! While I was cutting fabric, and pressing parts for the ladies, my phone was buzzing and ringing. I had 2 friends reaching out to check on “my” well being. While we were away from home, there was an accident on our busy road, right in front of our house. 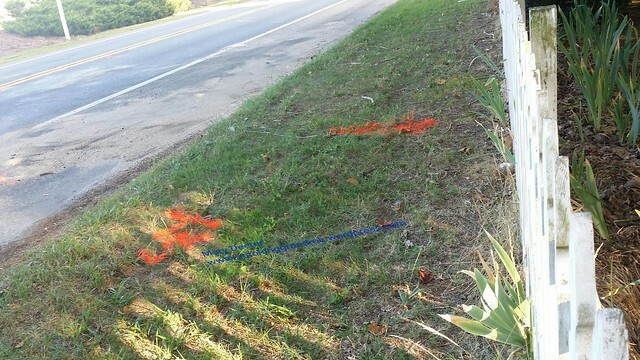 We came home to find the roadway covered in sand (to absorb the oil/fuel spills I suppose) and orange markings all over the road and in our lawn. I posted the picture above on Facebook and asked if anyone knew what had happened. Another friend sent me a link to the local fire company photo’s of the accident. Now the orange paint makes sense. The marks in our grass were LR (Left Rear) and RR (Right rear). I am guessing the red car crossed the center lane and hit the white car head on, pushing the white car back into our yard and narrowly missing our fence. I just don’t understand how this can happen at 35 mph! Big, wide shoulders on both sides of the road. I’m still shaking my head. (Not that everyone really drives the speed limit……) Neighbors who have to turn into the development across the street from us often talk about how risky making the turn is, with people passing on the right shoulder, rather than waiting for them to make the turn. Completely illegal in Delaware to pass on the shoulder. Getting out of our driveway during “commute times” is challenging, and we often have to wait 2 or 3 minutes for traffic. The speed limit changes to 25 mph just north of our house, so everyone going south is “speeding up” to the 35 mph (or higher) and traffic going north into town is (should be) slowing from 45 to 35 to 25….but that doesn’t happen. I guess we won’t know the “rest of the story” about this accident, but we were grateful to find the mailbox and fence intact when we arrived home a couple of hours after the incident. Both of these vehicles were seriously damaged, and I pray the occupants were not seriously injured. I could see in other photo’s that the “side curtain” air bags had deployed on the white Kia. I am thankful to, for those friends who cared enough to check on our well being. And, I am even more thankful that my husband decided to ride along with me to Brandywine to visit with June and Walt, instead of staying home to cut grass in the summer heat and humidity. Cutting that “strip” in front of the fence is always risky with the road traffic, but today is Saturday, much cooler and less traffic too! I should be out weeding, but I have a sundress to make! Stay safe on the roads this long holiday week, and slow down, give others a break, leave early and put down your phones while you are driving. I’ve been hanging out off and on with some lovely ladies at a local assisted living facility. My friend June, who is a resident there, asked me if I would come and sew with the residents. It’s really been a treat. 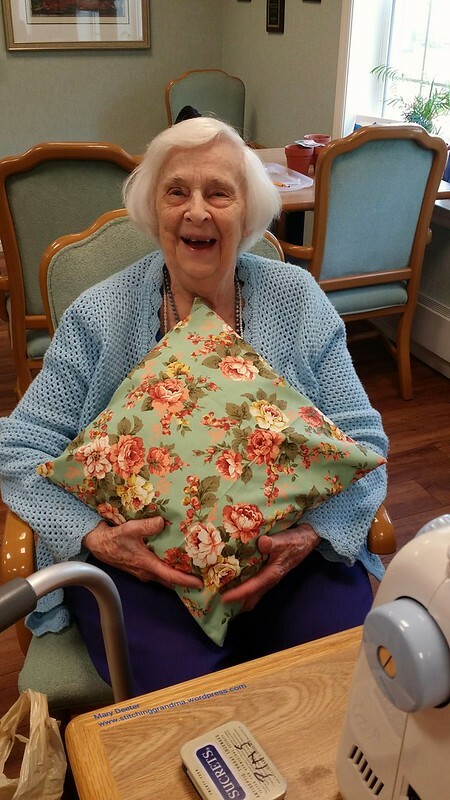 One day I came with a basket full of fabric, and this lovely lady in the photo below arrived (via her walker) with a tattered old pillow and case and asked to make a new cover for it. She picked out fabric from my basket, and together we came up with a plan for an “envelope” style pillow cover. I thought it would be handy to have something removable that could be washed. She liked my plan and I cut out the fabric. She came with her “own” box of pins, still in their SUCRETS box (for the 1960’s I am guessing! She did all the sewing, I just stood by to rethread needles and wind bobbins, and iron as necessary. In no time at all she had the pillow “slip-cover” made. Then I took a look at the existing pillow. Gosh, it was one of those pillow forms you buy and the actual cover of it was shredding. My fingers went right through the covering and I could see where she had patched it over the years. I suggested that the following week, we make a muslin cover for it, and stitch it closed. So, the following week, I supplied an adequate piece of muslin, and again we planned it out, I did the cutting and pressing and pinning, but Elsa stitched it herself. We stuffed her tattered pillow into that muslin case Elsa made, and sewed it shut. Then we put it in the lovely floral case that she made the week before. It should last Elsa for many years. 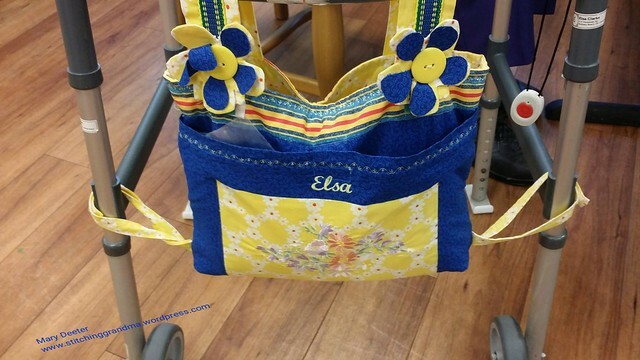 I admired this grand “walker-tote bag” she moves around the assisted living facility with. It has a lot of flair! It was made by her daughter, and certainly was well done. Our church project for the graduating high school seniors concluded in May. We got together in early May and did the final layering and tying, then I brought it home to bind. (Susie’s Magic Binding of course….google it if you want to know more) Picture below is the finished quilt. The quilt was presented on Mother’s Day, and the student in the photo below has the quilt over her shoulders, and is praying for her parents. I just love the presentation at church. This is the first time in the 10 years I have been involved with this program at church where we ONLY had one graduate. My month of May was busy with a house hunting trip in the Washington DC metro area with my daughter. We spent a lovely week together eating interesting foods and wandering through countless rental properties trying to narrow down one that would suit her family for the next couple of years. I was in sticker shock over the costs of rental properties. I had some time at 2 quilt bees, the Material Girls and the Queen Bees to do a bit more work on my “Autumn Jubilee” project. I take the project with me when ever I go to a bee. I now have 4 more placemats complete (except for the binding)! No pictures until I get them bound!! 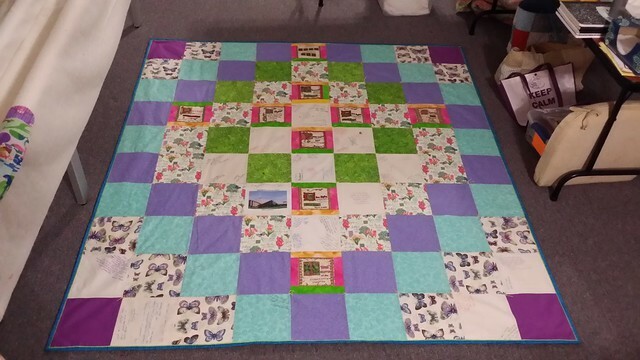 May and June also kept me busy with the From My Carolina Home mystery quilt – Scrap Dance Square Dance. The final clue of the mystery came out in June, and was able to close the door on another successful quilt along. I had planned for a twin size, but once I had it all on the design wall, I realised the dimensions were just too small for my taste, so I made more blocks and “supersized” the twin. (It is really a full according to the pattern, but I am calling it a supersized twin). It is 61×85 without borders or binding. I will probably just layer it and quilt “as is”, because it is a perfect size. I love the spinning stars. It is 98% scrappy. Only the white stars were created from yardage in my stash. I like seeing all the color choices others have made. The pattern is still up on Carole’s blog page until the end of the month. Get it for free now, before she pulls it down to publish commercially. It is quick, easy, and fun! That’s it for me for now. I have a sun dress pattern for a granddaughter all cut out and waiting to be sewn. I am going to try to work on it “between things” this week. I am handling the snacks at church again, all week, for the Vacation Bible School kids. Right now, there are 113 kids registered. The shopping and organizing is done, except for ice cream and strawberries for later in the week. (And I have a volunteer who is handling that area). I am gather motivation to crush 4 boxes of cookies in the food processor for VBS snacks tomorrow…..turning them into “sand” to go on top of vanilla pudding cups along with swedish fish! And then there is the popcorn to pop for Tuesday…..wish me luck and pray for a wonderful week with the children. How’s your sewing and June fun? PS, if you are a prayerful person, pray for my friend June who broke her back in early May and is slowly recovering.